“A girl my age who went outside without braided hair would face the most astringent citizen from the Grande Dames of High Society”. Presumably the work citizen was meant to be criticism. I recall Chris wrote elsewhere that he prefers to receive edits via email. “I felt an uneasy moment of sympathy for Caitlyn, despite everything she’d done for me”. Should be “done to me”. “I wondered, nastily, if the armsman would be able to get it and the horses out when the time came for him to lead.” Should be to leave, not to lead. And, of course, my own last post had a typo, work instead of word, in only five lines. I like this series and look forward to the ebook being available. Wrong word. As the armsman walls away into the estate. â…and the time came for him to leadâ. Should be â…and the time came for him to leaveâ. I wondered, nastily, if the armsman would be able to get it and the horses out when the time came for him to lead. Excellent snippet. Looking forward to reading more! Looking forward to the book and reading how Isabella adapts to her new situation. I’m looking forward to the book, the beginning is promising! One thing that stood out to me: Whats with the “Senior”? The meaning is clear, but I can’t remember it ever being said in the main series. IIRC it wasn’t used in the main series but IMO it is a reasonable “title” for a young family member to use in reference to an older family member that the younger doesn’t know the exact relationship between the two. The only “Senior” member of Cat’s family that we met was the Great-Aunt and Cat used the term Great-Aunt because Cat knew the relationship. Of course, Family Customs can vary so Isabella’s family may require the use of Senior until the senior family member says otherwise. Or it may be a way of referring to the MOST Senior Family Member in charge of things in the area and who gives orders to other Family Members and staff and servants on behave of the rest of the (Great) Family located elsewhere. I doubt that Isabella would call Morag Senior, unless Ira died or was no longer there and in charge of things. It might also be a way that members of a subsidiary or lesser family of a Great House referred to the Head of that branch of the Great House, even when they were in Shallot inside the Great House, i.e. to the person who has the right to give them orders inside their branch, while the Head of the Great House would be referred to as Patriarch or Matriarch. I am not sure if they would refer to Heads of other branches (families) of the Great House in the same way (Senior), there might be a different title (of respect) used. These Heads would be the primary members of the Family Council. I suspect that different Great Houses handled who else were members of the Family Council in somewhat different ways. In particular, I wonder about the status of spouses who married into the House regarding membership on the Family Council. Now if Cat was living in Great Aunt S’s household in the Capital City, she might call her Senior. Gaining membership in the Family Council has to be a significant step in anyone’s life and rise to real power in the (Great) Family (House). Perhaps Senior might be a way of referring to anyone on the Family Council, by anyone inside the Family who was not on the Family Council. There probably is some other title used for Family Council members. All we can say at the moment is that Senior seems to indicate some kind of position of authority or power, at least locally at Kirkhaven Hall that extends to the guardsman delivering Isabella there. It’s a honorific offered to older members of the family (i.e. a decade or so between you and them) when there isn’t a direct relationship or they haven’t said something like ‘call me uncle’. When is this coming out on kindle? I’m wondering whether this might not be better third person. Perhaps it’s just me but it feels a tad odd for some reason. Not sure why. I don’t see it myself …. Any others? It looks like someone else already found the typo I caught: “I felt an uneasy moment of sympathy for Caitlyn, despite everything she’d done for me,” where it should be “done to me”. Not going to bother to edit, just wanted to let you know that I’m very much looking forward to this book coming out. Something about this series… I just love it! At first I wasn’t certain about reading a book from Isabella’s POV, but you’ve sold me and now I’m greatly anticipating it. (Especially after the most recent book I read, not one of yours, was such a disappointment. You always look forward to something you know is going to be enjoyable after a let-down.) Anyway, it’s funny to me that I keep wanting to red your word “Kirkhaven” as Kirkwall, but that’s because I’m a Dragon Age fan. It’s nice to see the awakening beginnings of empathy in Isabella with her wondering whether her helplessness is something that Cat feels all the time so I’m anticipating reading further growth in her character. Like I said, I was a bit on the fence about Isabella, but I’m always a sucker for a good redemption arc. Was her vision a refference to the we’ll call it an Alternate Universe story written by the author of the Rachel Griffon Series? And not to change the subject, but I just wanted to float something out there about Cat, Akin and the rest of the gang back in Shallot. I feel like they would be called to the capitol by the king… Hear me out, I have three good cannonical reasons why this would be so. Point, the second: One of those same subjects, Akin Ruben, essentially executed the Crown Prince. He fulfilled the duty which possibly should have belonged to king and court. The king would want to make a display of his magnanimous forgiveness after the fact, seeing as Akin probably saved him from a very distasteful duty indeed. That would be the official story anyway, what the king would really be up to would be getting in front of the alliance and usurping its momentum for his own ends. At the least, the king would want to very publicly renew the Oaths of Fealty that the Houses owe him, and personally exert his authority over the Houses to show that they might be powerful but he was still the king. Point the Third: Ser Griffon’s Sword. Kings rely a lot of personal loyalty, on oaths and on “ring-giving” as it were, to cement their power. Kingsmen or the Royal Guard or whatever they are have special Object of Power armor, probably passed down from knight to squire, though it doesn’t say so, that the king probably appoints to his chosen knights. Ditto for a Kingsmen’s Sword, and now Ser Griffon has come back from Shallot with his own Object of Power sword. I would bet you anything you want that the king would leap all over that to secure the only known person who could forge Objects of Power. He could have her forge magic swords and power armor on behalf of the Crown, and for the first time not be relegated to only those few he has on hand but be able to appoint new kingsmen and reward them with new swords and armor thus growing his power-base as well as his military advantage. His prize potential sword-producer is under the protection of 2 Great Houses, who would not be much interested in handing her over to him (which makes things interesting), so summoning the Great Houses to the capitol makes sense not only from a power-display perspective, but also so that he can cast his eyes over Cat to see if he can’t find some way to entice her away from her family and into his own power. It would be very interesting to see the power struggle that would happen between the interests of the Crown, and the 2 Great Houses closing ranks to protect thier own. It would be very interesting. Anyway, even if that doesn’t happen, I’m still very much looking forward to reading Isabella’s story!! I have you on author alerts and I stalk you blog regularly even if I don;t always reveiw. Well, I just finished the draft, so I hope you enjoy it. I’m not quite sure what will happen to Cat and Akin in the weeks after TZE. As you say, the king will have good reason to want to reassert his authority. (And deal with the prospect of a major alliance, although that’s not as big a problem as you might think.) He’s also going to be torn about Akin killing the Crown Prince . But that’s something to address in Cat’s next story. I’m not sure yet. I find it difficult to sympathize with Isabella. I think she needs some kind of “save the cat” moment early on to become more redeemable in the reader’s eyes. I know where I think Chris is going with this one but of course he has surprised me before. The Isabella character is 12 years old. Unlike some instances in our own real history, she has escaped execution for treason because of her youth. This is interesting in one of Chris’s books. Chris is very aware that a cosseted childhood and adolescence are relatively modern creations, and this is often reflected in his books. Children are sometimes given great responsibilities based on their capabilities rather then their age, and are held responsible for their actions. Sometimes they face very harsh punishments for their mistakes, including mistakes due to youth and inexperience. Isabella has made a huge mistake and luckily escaped with her life. Already in this brief snippet she has shown the first glimpses of insight into her behaviour and even the first stirrings of empathy. If you have no sympathy for Isabella now I expect that you may get a good way through the book before developing any. I don’t expect that her redemption is going to come in the first few chapters, and I don’t expect it will take the form of saving Cat. It may well be that the book ends with only partial redemption coupled with hope for the future to be played out in future books. I will be interested to see. I expect the dream sequence does foreshadow eventual redemption for Isabella and perhaps her role in future books. After all, if she does return from exile, be it quickly or after many years, her and Cat can hardly be strangers to each other. “Save the Cat” is a term of art in writing, especially screen writing. One of the best known how to books on screen writing is titled Save the Cat. It just means some small act of kindness early on to win the audience over to the side of the protagonist. I wish I’d known that – I could have made a terrible pun . @Ihas. I also must confess my ignorance on this point. Thanks. That knowledge casts your comment in an entirely new light. Thank you. You procured the cover first. Interesting and different. They take some time to produce, so I normally try to order them a month or two in advance. 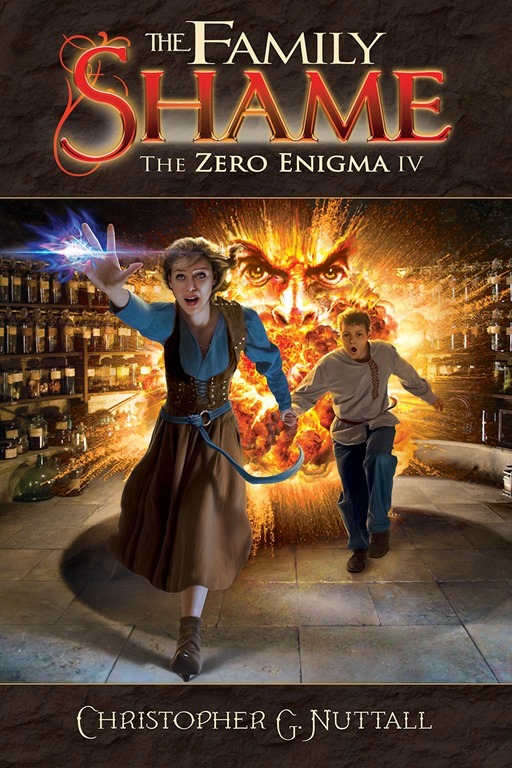 I just realized the cover advertises it as The Zero Enigma IV. I thought it was going to be a side novel. Do you have plans for further novels in this chronology? Yes, but they’ll all be relatively stand-alone until we get back to Cat. Isabella has an astonishing talent for making bad decisions. Did someone plant a compulsion on her, more like SiM subtle magic? I think Isabella is in the unfortunate situation of being far more talented and competent than her brother, but also in a highly patriarchal family that will never allow a female to become heir. So she went a bit mad, and others took advantage. Now that there is a legitimate reason for her to be passed over for promotion, she may find a new, more lucid, center from which she thrives. But I hope she is offered a return to grace in the family and tells them to stuff it. It’s more a case of her having grown up in an environment where she was treated as a princess, even though she had little prospect of formal power. It took some time for her to realise, at an emotional level, that that was no longer true. two things. where is Cat’s school? And WOW for the book. The school will be shown soon.